A man who murdered a schoolgirl and dumped her body on the Yorkshire moors 30 years ago has been told he cannot appeal against his conviction. 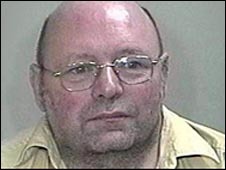 Ronald Castree, 54, was jailed in November 2007 for abducting and killing 11-year-old Lesley Molseed in 1975. Judges at the hearing in Leeds also refused a separate request to cut Castree's 30-year minimum jail term. Castree, of Brandon Crescent, Oldham, Greater Manchester, snatched Lesley from her Rochdale home in October 1975. Her body was later found on Rishworth Moor in West Yorkshire. After the hearing Lesley's sister Laura Anderson said: "I'm not going to give him another thought." Stefan Kiszko was wrongly convicted for the murder and spent 16 years in jail. He died soon after his release. Bradford Crown Court heard Castree, a comic book dealer, had abducted Lesley as she went on an errand for her mother on Sunday 5 October, 1975. Her body was found three days later on moorland on the border of West Yorkshire and Greater Manchester. She had been stabbed 12 times during a "frenzied attack", the jury was told.